Brazil Company Embraer expects to sell its Super Tucano light attack aicraft to NATO countries. 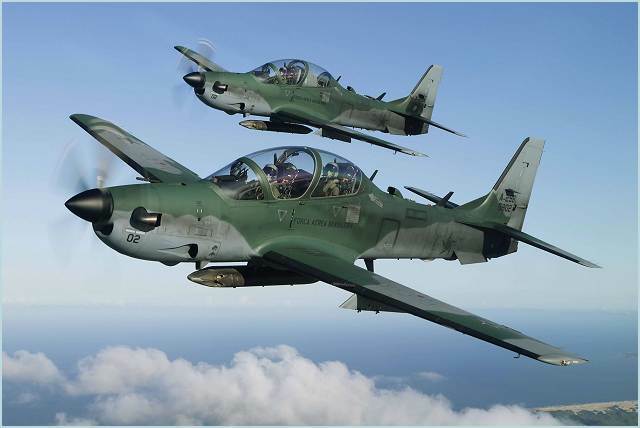 Brazil's Embraer expects to sell its Super Tucano light attack aircraft to more NATO nations after clinching an order from the United States that lifted the company into the upper echelons of global defense contractors, a top executive told Reuters. Buoyed by the U.S. endorsement, Embraer's defense unit could make up a quarter of its revenue by 2020, Aguiar said, up from an estimated 14 percent last year and under 5 percent in 2006. The unit promises steady growth with Brazil's armed forces as the country bolsters protection of its vast borders and far-flung offshore oil reserves, reducing Embraer's reliance on highly cyclical revenue from civil aviation. But as Embraer's defense ambitions grow in foreign countries, it also faces more politically charged competition. The U.S. Air Force halted the $355 million Super Tucano order last week due to a lawsuit from losing bidder Hawker-Beechcraft , of Kansas, stirring nationalist rhetoric from local lawmakers and Republican presidential candidate Newt Gingrich. Aguiar dismissed the political risks, confident that a swift decision in courts will free up Embraer to deliver the Air Force's first Super Tucanos from a new Florida plant next year. "Our team is totally ready. No one was deactivated," said Aguiar. "You just press the button and we go to work." The order could grow to $950 million for 55 aircraft, which are designed for surveillance and counterinsurgency operations in rugged conditions like the Afghanistan border. The U.S. contract is the first for the Super Tucano in the NATO alliance. An earlier generation of the plane, known as the Tucano, was used beginning in 1989 for pilot training in France and the United Kingdom.